In this week's Friday Memo to our staff, the topic I focused on was Personal Learning Networks, or PLNs. 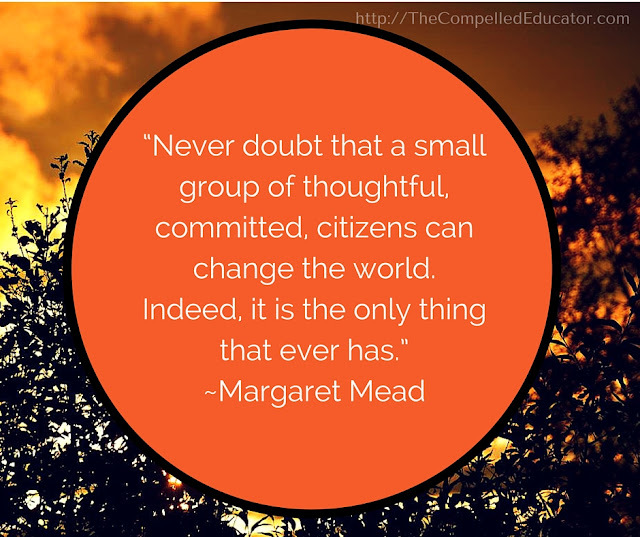 I don't think just knowing what an online PLN is creates enough motivation for an educator to create one. Creating or joining an online PLN is a scary process for some educators. 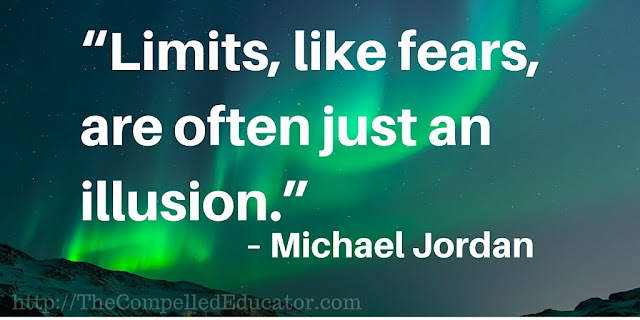 It requires reaching out (fear, vulnerability), learning something new (fear, vulnerability), and change/stepping out of comfort zones (doing something new, applying new learning, listening to conflicting viewpoints - fear, vulnerability). 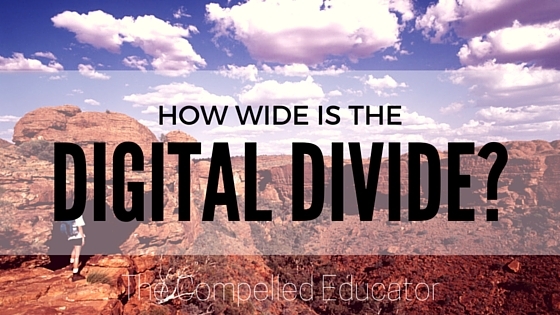 It caused me to reflect on the question, "Are online PLNs necessary?" Online collaboration is not a foreign concept. From entrepreneurs to business organizations, it is part of the natural workflow as well as networking. There is value from connecting with others in same career field to share ideas and collaborate on projects. Each individual brings different experiences, knowledge, and backgrounds to the table, which creates opportunities for growth by each member of the group. Educators must be part of this process for two reasons: 1) Students today will be entering this world in their future. We need to prepare them for those situations. 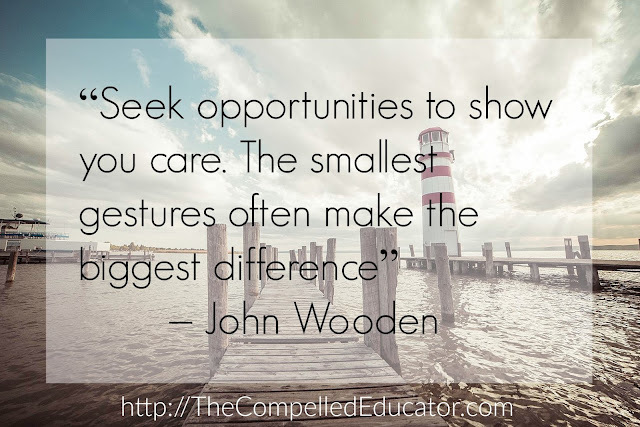 2) As educators, we have the opportunity to learn from others to improve what we do for students. "We must remember that lifelong learning requires effort. We expect this commitment from students. We should accept no less from ourselves." Something else I shared with the staff in the Friday Memo was an article by Lisa Nielson (@InnovativeEdu), titled The PLN Matures. The Progression of the 21st Century Personal Learning Network. In the article, Lisa shares a story of how a PLN progresses to a final stage she calls Collaborative Creation. She tells stories of edcamps that are organized by virtual collaboration and educators within the same area of expertise who collaborate on projects virtually. I collaborate with my PLN often and in many different ways. When I organized a PD for our teachers on how to use Google Hangouts in the classroom, I got help from educators across the country. For the PD I have planned for our PE teachers next week, I reached out to Justin Schleider. I'm not a former PE teacher, so I wanted input on how to maximize the PD for our teachers. I contacted Justin via Voxer, and he got back with me almost immediately. I was amazed at the level of support and assistance he provided to me so that I can provide an awesome day of learning for our teachers! 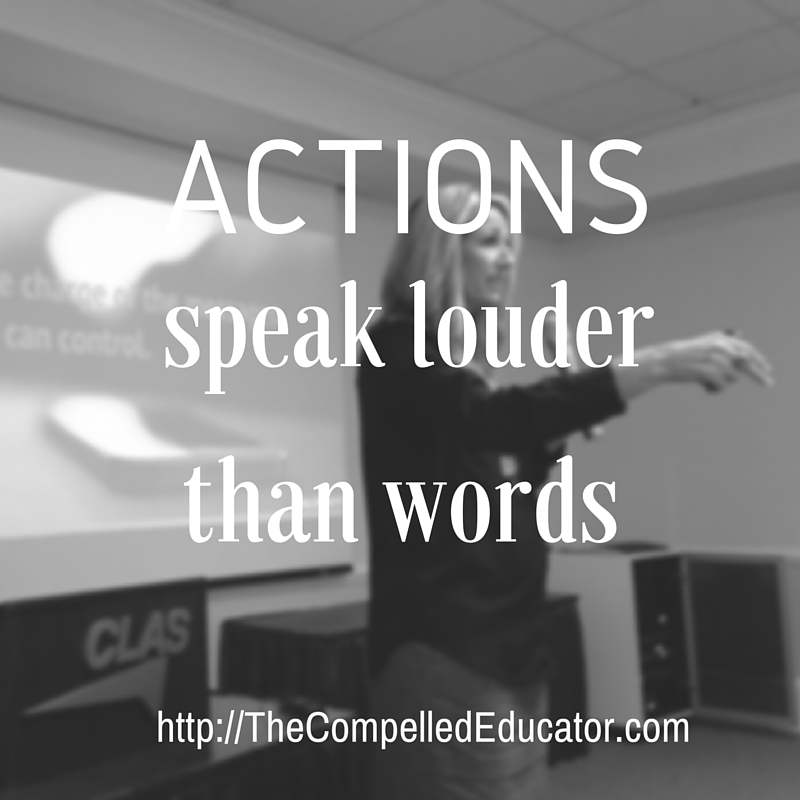 The Compelled Tribe that I co-lead with Craig Vroom (@vroom6) is an incredible group of bloggers that stretches me to grow as an educator through reflection about my practice. The #ALedchat team and the weekly twitter chat continues to teach me each week about different education topics. The many different educators with varied areas of expertise help me to learn either more deeply about a topic or they introduce me to a new concept or tool. The Women in Education Leadership Voxer group amazes me each day with the empathy, expertise, and experience that we collectively use to support each other. While I see the tremendous value of connecting online, I need to make sure that I help others to see the value. I don't expect them to automatically jump to Collaborative Creation, but I do want them to progress on the continuum. I have some experiences planned for our teachers this semester to help them get started and grow their PLN. I would also love to hear your ideas! Working on autopilot is easy. Doing what you’ve always done is safe. You show up. You shut your mind off. Boring. What can be done to break the cycle of just showing up and going through the motions? Set your intention. To break any cycle, it must be intentional. Make a decision to be present at work, have positive self-talk, and meet your goals. Re-acquaint yourself with your professional goals. Do they align with your organization? If they don’t, it may be time to look for another position, organization, or profession. If they DO align with the organization, re-commit to your goals and seek out mentors or leaders with whom you can share your goals and who will support you in reaching them. Pay attention to your internal judgment messages, such as “Grading papers is monotonous ” or “Bosses can’t be trusted” or “My colleague is trying to show me up.” When you pay attention and let go of these messages, your emotional intelligence improves and the negative judgment messages won’t drive your behavior. Practice gratitude. When you practice this daily activity, it redirects your focus from the negative to the positive, from what you don’t have to what you do have. Gratitude strengthens relationships and reduces stress. Just five minutes a day of practicing gratitude can rewire your brain and create a more positive, productive, creative YOU. Help your employee re-focus on the WHY. The organization has goals, and each employee is a vital part of the team working towards achieving the goals. Start a dialogue with your employee about the team’s goals, the meaningful work required of the employee, and your employee’s goals. Additionally, commit to helping your employee succeed in reaching his or her goals. Avoid the “tell me what to do” trap. 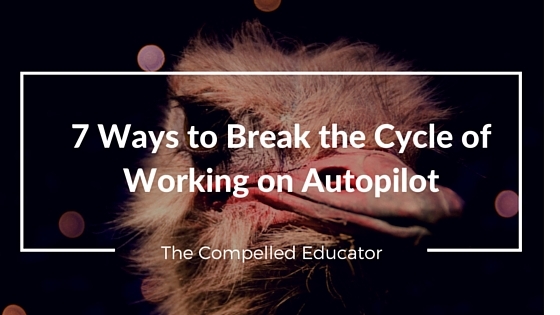 Employees who are on autopilot will ask the leader to tell them what to do. This perpetuates the cycle of showing up for work and going through the motions. As a leader, help your employee get clear on what he or she brings to the table that will help in achieving the desired goal. Model the behavior you expect. Model innovation for your employees. Show your employees that you are invested and giving your best. Collaborate with others, give praise, and say thank you. Model commitment and fortitude. What other ways can we help ourselves or others re-engage at work? "How can I create a custom header image for my or my school's twitter account?" I've gotten this question from several people who have purchased my mini-course, How to Tell Your School's Story on Twitter, so I thought I'd put together a blog post to help all levels of twitter users to create a custom image. First, it's important to know the sizes of images that are needed for your cover photo (header image). This will help you in making sure your photos aren't too large or too small for the space. Hands down, the best way to create these images at the optimum sizes are by using Canva. Canva, as I've shared previously, is an incredible resource for blogging and social media graphics. I discovered Canva last spring, and I've use it for all kinds of graphics, posters, flyers, and more! One of the many things I love about Canva is that it has pre-sized "templates" which makes it easy to find what you need quickly. That means more time for creating! So let's get started on how to create a custom Twitter header image. When you open Canva, you will see several options of sizes, but you will need to click the "More" square (see above). Once you click on "More," scroll down to the section titled, "Social Media & Email Headers." You will see the option called "Twitter Header." This is the one you should select. It is already sized to 100px X 500px. Another nice feature of Canva is that they show you where your profile picture will be in relation to the header image. This helpful when you have group photos, words, and other images with specific items that need to be visible in the header. Once you're at this point, it's time to customize! Use the options to the left to choose your background, image, text, etc. for your twitter header image. Once you have created your image in Canva and downloaded it to your computer, open up twitter and click on yourself, then choose the button on the right (just below the header) titled, "Edit Profile." When you do this, you will see where you can make edits to your profile. In the photo above, you can see where there is an overlay on my header image that says, "Change your header photo." Clicking on those words brings up another small pop-up box where you will choose "Upload photo." I recently changed my twitter header to reflect my 3 words for 2016. I'm trying to put them in as many places as I can so that they can be a visual reminder for me throughout the year. Twitter Tip: When you create images for a tweet, you need to use a specific size to for optimum viewing. Guess what? Canva has this option, too! Just look under the "Social Media Posts" section for the perfect size. 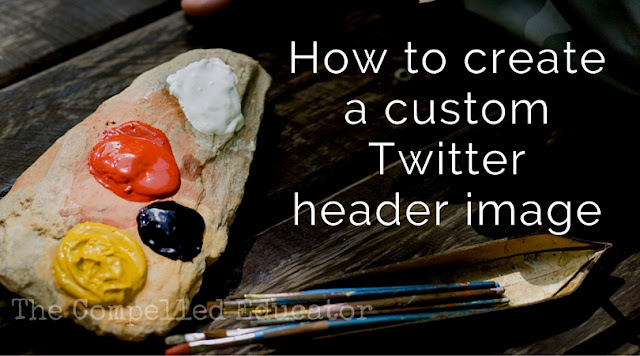 When you create your custom header using these tips, be sure to let me know on Twitter (@jennifer_hogan)! I would love to see your creations! I’ve heard it said by others, and I’ve been guilty of saying it myself. I think it's natural to share ways in which we personally learn best. Have you said it? When trying to help students learn what they need to learn? As teachers, we can project our own learning style into our lesson design. Sometimes it happens subconsciously and sometimes, unfortunately, intentionally. Often, the missing component in our lesson design is the student voice of the person who is doing the learning. Doesn’t it make more sense to design lessons based on how students learn best? 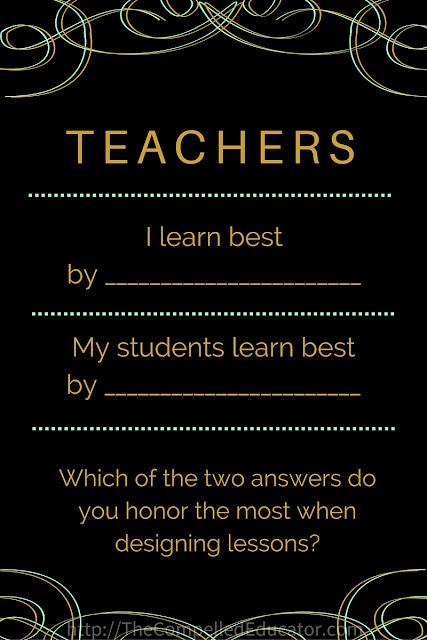 How can we know how students learn best? Let’s ask them! It’s the start of a new semester and calendar year, and it’s a perfect time to re-visit what worked and what didn’t work during the first semester. Reflection, analyzing, learning, planning... they are all part of getting better at what we do. To incorporate student voice into lesson design, teachers can give a short survey via a Google Form and collect feedback from students. 1. I wish my teacher would start doing _________. 2. I wish my teacher would stop doing _________. 3. 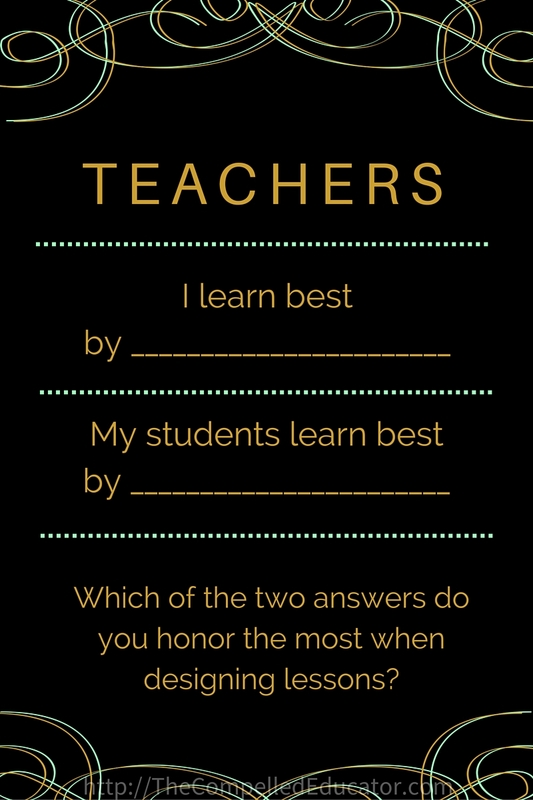 I learn best in class when _____________. i learn best when im doing something i like. the teacher has figured out, through experience, how to teach a class of students about the subject at hand. Two other things that contributes to my learning is when the teacher and the lessons are in good balance and the students in the class aren’t always talking but also aren’t dead and silent. Im a visual learner i learn best from seeing pictures and presentations. The teacher is interesting and actually knows a lot more about the topic or subject and can connect it to the real world. When i am active and we are doing something fun that keeps me interested. I am interested and the teacher makes the class more lively. I can see it, then practice it myself. We do hands on activities instead of taking notes for thirty minutes at a time. I learn better by games and any fun activity that deals with that day’s lesson; this is the reason I do so well in my history class. I can relate to the issues at hand or when I am learning about something that is interesting or it is portrayed to me in an abstract way. We do a lot of examples together and all the content of the lesson is very organized. Wiggins reminds us that what works for some people doesn’t work for others, which means that instruction must be varied and offer choice. 1. Survey your students for their feedback. 2. 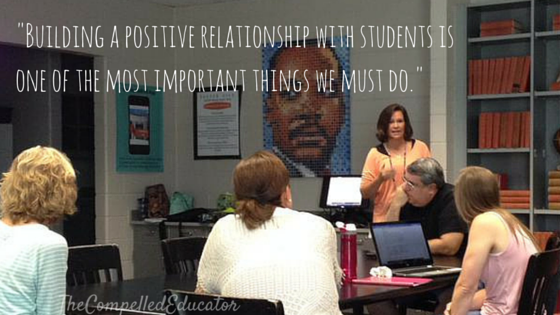 Meet with someone to discuss the results – an administrator, instructional coach, or a trusted colleague. They will help you find patterns & gaps and offer suggestions for future lessons. Teachers, how do you get feedback about your instruction (NOT including students’ grades)? And how do you use it in lesson design? I love using photos on my blog or in posts on Twitter or Facebook. One issue that we face is that some photos have rules that prevent them from being used and shared by others. Fortunately, there are photo sites that allow us to use their photos for free. Today I’m sharing three that I use. They have beautiful images that are updated every 10 days, and you can even do a search for a specific topic/image. A site relative new to me is Picography. The photos on the site are large and of high quality. Just scrolling through the images on the site is inspiring. I bet you will find what you need there. Photographs are provided free of charge and under the Creative Commons Public Domain CC0 licence. By downloading an image from Picography you agree to all terms and conditions stated on this page. At the bottom of the site, there is a section titled “Browse more,” where the photos are sorted by tags. 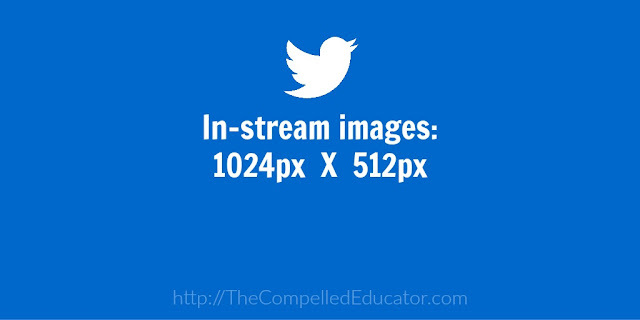 Take pictures of great things happening in your classroom or school, add a text overlay, and share on twitter. I would love to see your creations! Share with me on twitter -- @jennifer_hogan. We're kicking off 2016 with our first global twitter chat of the year! There have been a flurry of resolutions, goal-setting, one word and three words for 2016 that have been shared in blog posts and on social media over the last two weeks. We understand the importance of setting ourselves up for success in order to make sure that we reach our goals for the year, and we want you to join us tonight and share your insights, experiences, and perspectives on this topic. The first obstacle you face on the path to success is often the hardest to overcome. What is your plan for when you meet that first obstacle? Success comes from targeted action on a regular basis. What new/continuing habits or routines do you have planned for 2016? 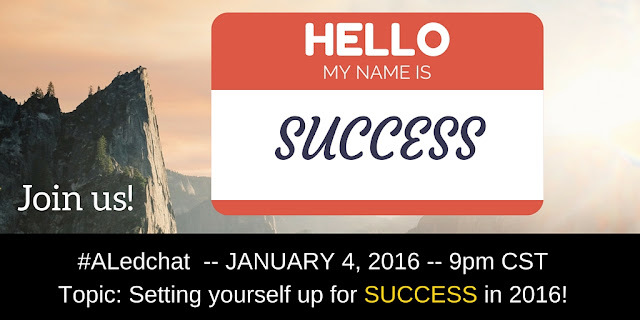 How does/should failure fit into our plan for success in 2016? What is your plan for recovery from failure in 2016? 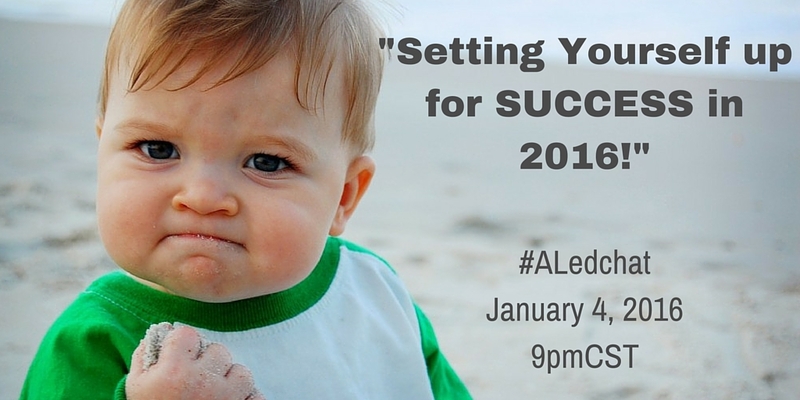 How will you use technology to make your life easier/more successful in 2016? Will it play a role in setting yourself up for success? What are you giving up in 2016 that has to happen in order for you to reach your goals? What will you do to insure that you stick with giving it up? What resources (people included) do you have to help you be successful? What resources do you need? How will you monitor your progress during 2016? Share plans for frequency, method, accountability, etc. How will you know when you have reached your goal, and how will you celebrate your success? **Update: Click HERE for the archive of the chat. Have you ever heard seen different messages in different places that all converge on one idea and feel like the message is for you? That's the premise that has been the driving force behind this blog post. First, I reflected on my year in 2015 and thought about where I wanted to go in 2016 both personally and professionally. Then I shared my three words for 2016 with you. The same day I hit "Publish" on my post, I came across this picture on my husband's Facebook feed. 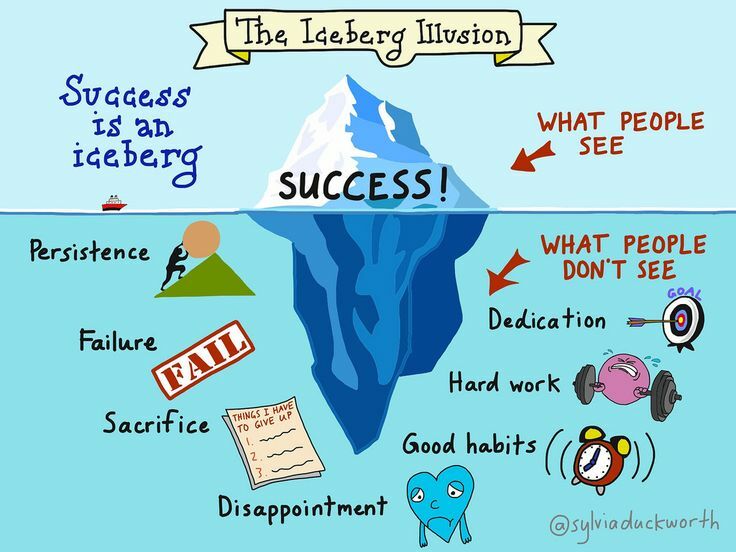 My husband is a big believer in working hard, and I really like this image. The list above gives 10 things that we have control over. There's nothing on the list above that must be left up to chance. 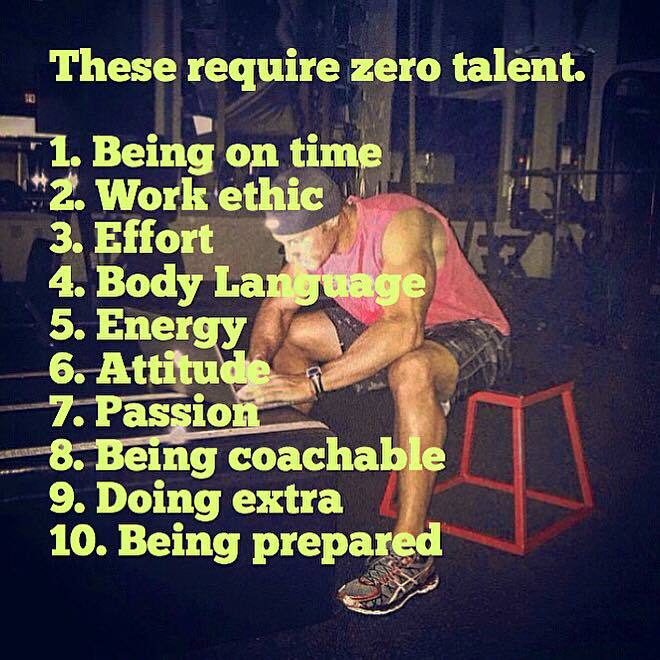 We can choose to do the work and get better at all of them, or not. The next graphic I came across was on twitter. It's one I had seen before, but it really resonated with me in the midst of where my head was at. The last time I saw this graphic, it was in the context of not comparing your life to someone's timeline on social media. We tend to share the positive experiences and accomplishments on social media, and we can fall into the trap of thinking that other people have "perfect" lives when we feel like ours is full of missteps and disappointments. When I saw in on Twitter recently, I thought about the upcoming year. For success to happen, there will be a lot of "behind the scenes" action. Good things, bad things, and a lot of hard work. I feel motivated by my three words, FOCUS, PURPOSE, and DO, and I'm ready to continue my momentum into the new year. The last message that I came across was the video below of Stephen Curry. In case you haven't heard of Stephen Curry, he is currently one of the TOP players in the NBA, leading his team, the Golden State Warriors, to an NBA championship in 2015. As soon as I saw this video, I emailed this link to my daughter, a college basketball player, and told her to "watch this video. Every. Single. Day." In the video, Curry reads his ((unflattering)) 2009 draft report. It gave me chills the first time I watched the video, as I am aware of the incredible ball handler, shooter, and leader that he is today. At all levels, there are people to continue to grow. Curry is not where he is today because he talked the talk. He is there because he put in the work. Every. Single. Day. That is what I want to am going to do in 2016. What walk will you be walking? It's hard to believe two-thousand-and-sixteen is here. And when I had my oldest daughter, who is a freshman in college. And my first teaching job, which I started 24 years ago. And... here it is the end of another year that has gone by extremely fast. I love that I can look back on a year through the blog posts I've written. I can reflect, rejoice, and celebrate small and large moments. I learn from my mistakes, and I learn from your comments and insight. I hope you've learned from my experiences, affirmed your own experiences, or were positively affected in any kind of way by reading my blog. Thank you for stopping by, reading, commenting, and sharing. 10... A Year from Now, What Will You Wish You had Started? 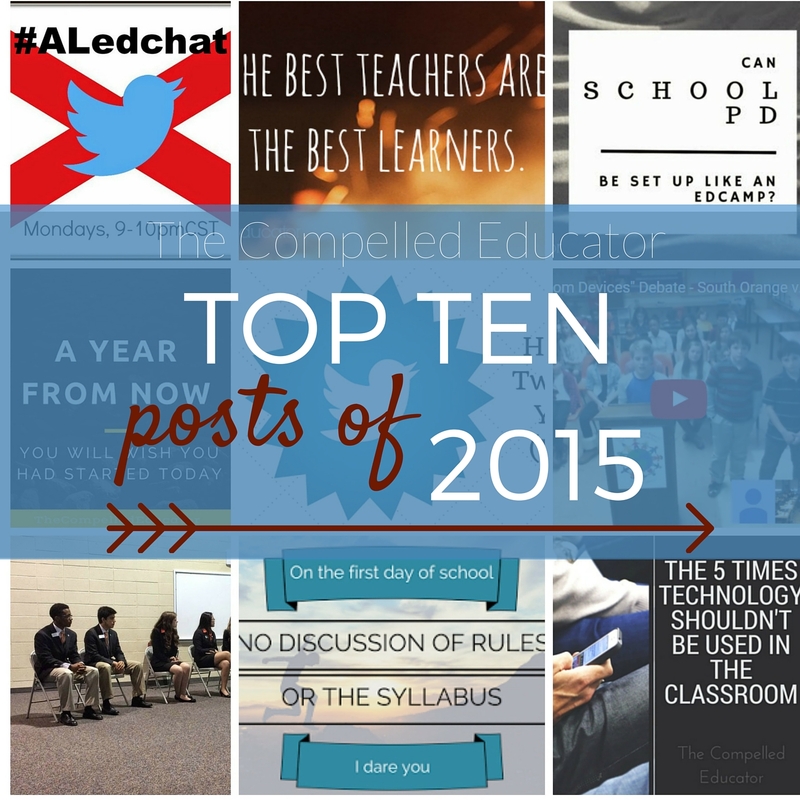 8... Can School PD be Set Up Like an Edcamp? Tell me your favorite in the comments.